In one of the most unsatisfactory prize fights ever witnessed in this country. James J. Jeffries proved to be the victor last night over Gus Ruhlin, the "Akron Giant” in the fifth round of what was to have been a twenty round struggle, Ruhlin wilted and then surrendered to his peer to the utter amazement and disgust of the assembled thousands. No one was more surprised at the outcome than Jeffries himself who asserted that while he had delivered one telling blow in the second round, he did not expect to win the victory so easily. Ruhlin’s sole explanation of the outcome of the fight is that he received a chance blow which utterly disabled him and that Jeffries persisted in fighting him low. While Ruhlin will make no absolute charge of Jeffries having committed a foul, he intimates that he was unfairly handled, and injured as the result. Ruhlin received the support of his seconds in this stand, who say his was a hopeless case after the second round. When Ruhlin went to his dressing room he was followed by a very depressed retinue. The defeated man complained of no pain and moved about without assistance. 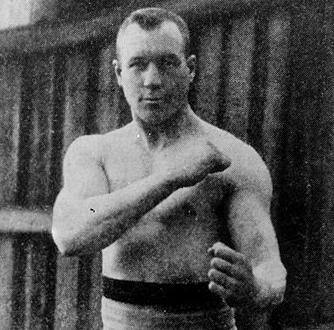 Before an assemblage of about ten .thousand people at Mechanics' pavilion, which has been the scene of many bitter and important struggles in the past, James J. Jeffries, of Los Angeles, Cal., met Gus Ruhlin, the "Akron Giant," last night and fought for the title he has held since his memorable battle- with Bob Fitzsimmons. Never in the history of San Francisco has there been such a crush of humanity at a pugilistic event. Hardly had the sun hidden itself behind the hills before the great pavilion began to fill with an enthusiastic crowd gathered to watch the championship contest. Thousands poured into the gallery when the doors finally opened and long Before the first preliminary was called the upper portion of the pavilion was black with spectators, people coming from pointy between Vancouver and Mexico and embracing well known state officials, members of the judiciary and prominent sporting people, .who early took possession of the high priced seats. Ruhlin leads for the head and lands lightly with the left. They clinch. Both men are cautious. Jeffries' left goes around Ruhlin's head, but does no damage. Jeffries tapped Gus lightly on the head with his left. The latter cleverly ducked a light left. Jeffries uppercut Ruhlin to the Jaw with his left. Jeffries landed his left on the body, hut missed another for the head. Ruhlin countered with his left. Jeffries swung again but missed. Gus blocked a left Jab for the face. Jeffries rushed, but Ruhlin came into a clinch.. Jeff essays a left for the body, but the Ohio man got out of harms way. Jeffries is smiling. The round was tame with the champion having slightly the advantage. The men came up strong and Ruhlin shot in with a right and left, which were stopped. Jeff elbowed his way back and forth and caught the Akron man with a terrific left to the neck. Jeff pursued Gus and swung with both hands. In the rush Jeff landed a weak body blow. Ruhlin again appeals to the referee. Gus ducked and was met with a straight left. He feinted and came back with an ineffectual short arm punch. Jeff easily held the advantage with Gus constantly complaining. The men .closed in several times. Ruhlin was fighting low and Jeffries was apparently looking for a chance. Jeff retreated about the ring until the spectators hissed him,. The round ended with neither man In distress, but with Ruhlin the more worried of the two. After a short exchange at close range, Ruhlin landed on the face. He was forced back and Jeff smiled as Ruhlin again rebuked him, Jeff landed his left, blacking Gus's eye, and- then pursued him, lighting at short range and plainly wearing his man down. Ruhlin lacked aggressiveness and retreated as Jeff swung his left and right and missed, Gus led for the face and Jeff pushed him across the ring. Then the champion walked Gus across the ring again and landed a fierce blow on his Jaw , Ruhlin shot out ineffectual lefts. Jeff waded in, whaling Ruhlin right and left, Gus went down and took the count. He came up apparently weak and the gong saved him. Ruhlin was plainly in the greatest, distress when the round closed. This round was much in Jeff’s favor. advantage and bore In, touching Ruhlin beneath the chin with a right, forcing Ruhlin to the ropes, after which Gus went to the floor and at the count Of five staggered to his feet. He ceased fighting and Jeff went in for a knockout. Ruhlin was utterly dazed and missed wild swings, while Jeff threw him against the ropes. Billy Madden and then, "Denver" Ed Martin walked to the center of the ring and hailed Referee Corbett. "We give up.." said Martin. and the fight was over. the champion while they denounced Ruhlin as a quitter and fakir. way out of the ring. Lou Houseman, George Siler and George Hartlng, the official time keeper for the club, declared that Ruhlin was greatly overestimated, that his blows were weak and easily blocked and that he was positively without endurance. While some expressions were heard in the throng after the fight placing the stigma of a fake affair on the management, it was the consensus of opinion that Ruhlin fought a losing battle In order to obtain the short end of an enormous prize. Boxing In San Francisco has not been helped by this event. The city supervisors at the ringside last night expressed great dissatisfaction and even went so far as to entertain suspicion in their minds of a fistic swindle. It is estimated that something over $40,000 was realized at the box office. Of this 62% per cent Is divided In purses of 75 and 25 per cent and goes to the., participants In the event. "I think Madden made a mistake.He should have thought of the crowd that had paid a big admission fee to see the fight. The crowd that attends such exhibitions wants to see the defeated man knocked out. The fight might have gone another round or two when a decisive blow might have been given." "I had not started to fight when Madden threw up the sponge. Had I gone at Ruhlin I am sure he would not have lasted two rounds. Ruhlin was scared from the first:"
It is thought that' only about $20,000 was bet on the fight.